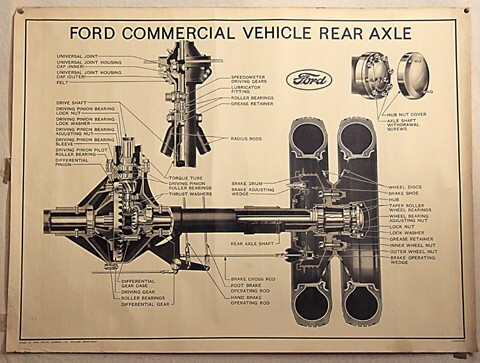 Originally Printed by The Ford Motor Company, Facilities Department, wall hanging, cut away section view detail print of a drawing, of a twin rear wheel axle, Ford Commercial Vehicle. shows the crown wheel and pinion, wheels, half shafts, bearings, torque tube and universial joint as used for educational purpose or mounting on your wall, has linen backing. Measures 1010mm x 760mm. Condition is near perfect, has very slight colour change due to aging.